Questions have been swirling about the next new business for Franklin's busiest block since the Candy Rush closed (sob), and yesterday, Brownstoner officially broke the news that Cool Pony has arrived (albeit somewhat incompletely/incorrectly - Kevin and Garnet, who still own the space, have leased it and won't be running the new spot). ILFA swung by today on the recommendations of readers (who'd already been in - thanks to Ben for the top photo, above) and learned that the shop will be quite the multi-purpose place. During the day, they'll have it set up as a thrift store and record shop (with a pile of 78s already on the shelf), and at night, it will transition to a live music and performance venue serving small bites and, if the application process goes well, beer and wine. While they're aiming for an "official" grand opening on March 1st, they're kicking things off this weekend with a slate of events that includes a Friday night square dance and a Sunday night adult puppet show, among others. Swing by this weekend to check them (and lots of live performances) out. Press release and full schedule to follow in this space. I feel bad for the neighbors and recommend arguing against a beer/wine license. This reeks of late night parties. How do they expect to pay there rent which rumored to be on excess of 5,000$. Good luck with that selling (clears throat) 78's! there are enough quirky thrift-style shops on the avenue as it is, not sure what this one hopes to add (and this is coming from someone who is probably among their intended demo). It would be great if people didn't have a choice to be anonymous. May I ask the 3 previous people who commented what you would like to see on Franklin Ave? Also, how long have you lived here and do you ever examine the fact that you may be a part of the reason people feel like they can open up these stores? Everyone is a critic but no one has a good idea. The fact is, Kev still owns the building and he is a long time member of the community who does massive amounts of GOOD. Let the man rent out his space to who he chooses. They didn't feel like running a candy shop anymore. Get over it. Maybe if you had spent more money there we wouldn't have this convo. Jon, I don't see any attack on Kevin happening, just questioning (and yes some early critiquing) of the idea of a record store slash squaredance/adultpuppet space, which you gotta admit sounds quirky and almost like some caricature of hipsterism. I hope sincerely that anyone opening a business succeeds and does well, including this one. The problem with Candy Rush was not "you should have spent more money"...it simply wasn't set up right to draw people in. Look at Ample Hills, people walk from Franklin all the way there for ice cream. While I wish this business luck, I fear this neighborhood has changed so much over the last few years that the key demographics that they are counting on to support this type of business has been already priced out. 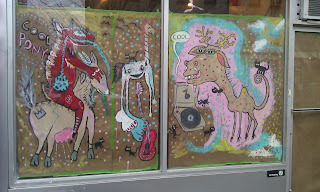 As one of the only retail options on the Ave, I am super psyched to see what Cool Pony will bring. That said, a lot of business open with a thousand and one amazing ideas, but that doesn't mean they will be able to implement them all. I'm sure many people will be happy just to have another spot to buy fun stuff and gifts, and a venue for fun performances. Yes, it does sound a bit like a Portlandia sketch, but obviously that's what people want! Quirky businesses owned by cool people with good ideas. Mike F you may be right but I hope you're wrong. I think this type of space (if it doesn't push irony and hipsterism too hard) could make a great difference. Take Launchpad...it's been around for 3 years and has incubated 3 distinct, positive institutions (yoga collective, it takes a village, slapdash) albeit with mixed success, not to mention dozens of terrific events that have offered mixed use for community members of all stripes. If Cool Pony has the stuff to follow that model and allow creative members of the community who have not already been priced out, we could see a terrifically vibrant and diverse culture expand in the neighborhood. The trust fund kids have my respect until they accuse those who have to make a profit to eat and pay rent of "selling out" or being obsessed with money. Sounds interesting. Personally it's not my thing. I wish them well though. I hope residents support them. If I had a spot on Franklin ave. I would open a tex mex take out spot. The decor would be full of color. I know there is chavelas, but I'm talking about a quick take out spot with 4-5 tables. Another option would be a diner. The coffee shops close early and with all the bars on franklin, people need to eat late and sober up. The diner would fit the hipster vibe and not the typical diner decor. Although with a diner, you'd need a decent size lot. The one on the corner of franklin and St. John's might do if it were available for lease. Just my opinion. Thrift shops are clothing pawn shops. We need to protest in front of these stores. These trust fund losers protest pawn shops but not bars for white people. Lets open a Battlestar Gallactica Bar so drunk geeks can throw up all over our sidewalks. You people are disgusting. Ugly bearded men with fat girlfriends still playing kickball at 40. ^^^^you're incoherent and angry. So you dont like white people or fat people, got it. Fine. Except there actually isnt vomit "all over the sidewalks". why can't we all just be siempre amigos?